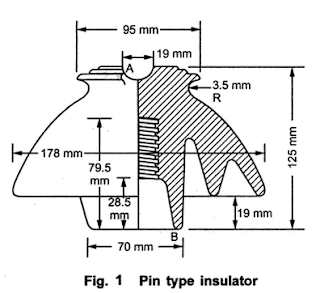 A typical pin type insulator is shown in the Fig. 1. For lower voltages upto 11 kV generally one piece pin type insulator is used. But for higher working voltages like 33 kV, 45 kV , 66 kV and beyond it two piece, three piece, four piece pin type insulators can be used. But its use is restricted up to kV as for higher voltages, the pin insulators are uneconomical. The pin insulators become very bulky for higher voltages. 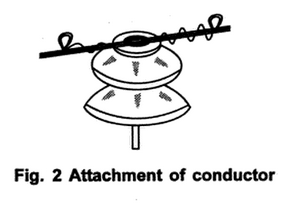 On the upper end, there is a groove for housing the conductor. The pin insulators are very firmly secured to the cross arm on the transmission pole with the help of steel bolts. To avoid the direct contact of hard metal with porcelain, the lead screws are used. In such case two methods are used to secure insulator to the bolt. 1. The porcelain insulator has cement threads which are lined with a soft material like lead. The pin is screwed into such cement screw. 2. Solid lead screw is casted on the head of the pin and is screwed directly into the porcelain. Such type of insulators are used for the transmission lines which are running straight. The conductor passes through the groove on the upper end and is bound by the binding wire of the soft copper or soft aluminium i.e. of the same material as that of conductor. This is shown in the Fig. 2. The bending wire should cover at least 4 to 5 turns before its ends are wrapped with the conductor. When the insulators are wet their outer surface is almost conducting. To keep the inner side of the insulator dry, the rain sheds are provided or now a days surfaces are provided with petticoats. But design of these sheds or petticoats is such that their surface must lie along the equipotential surfaces of the electrostatic fields while the body is so shaped to lie along the lines of the electrostatic fields. Due to this, leakage resistance of each shell remains same, keeping capacitance of each shell also same. Due to this, there is uniform voltage distribution along the shells. Such petticoats help avoid flashover and leakage current also.